My current book is ok, but it's not calling to me. If I set it aside, I doubt I'll go back to it, so I'm soldiering on. I have several book reviews to compose, but like you, I'm not very motivated. It seems I've ignored posting while catching up with blog hopping. It always seems to be one or the other, at least for me. Enjoy your Sunday! We're going to be in the 90s/100s this coming week with no rain in sight. Here's to an early fall! Les - I might just do a batch of mini-reviews and pretend I'm caught up! We'll be in the 80's most of the week, but cooler nights make it feel almost like fall... the leaves are even starting to change! Pancakes sound perfect :) Fall is my favorite season as well. I love the weather, I love the way it smells, etc. Have a great week! Jennifer - Yup, me too... I love everything about fall, but winter is another story. I just listened yesterday to a bit in Consider the Fork about pancakes (crepes, actually, but she called them pancakes...) I think you'd like that book. Audrey - I haven't read Lipman before, but The View From Penthouse B is very entertaining... it feels so 21st century! Audible's return policy is very generous, but it seems so strange to return a book I don't like! The narrator is fine, it's the story that just isn't doing anything for me. We'll see... Consider the Fork is on my wish list. I seem to be gravitating toward food books lately! You are giving me a bad feeling about Transatlantic. Let the Great World Spin grabbed me and drug me into the narrative, which is the way it should be. Not that you feel like you have to listen so you don't waste a credit :( And that tiny little ball of a dog...so sweet she is. Sandy - I loved the audio version of Let the Great World Spin, so maybe my expectations are just too high. The stories don't seem nearly as compelling and, at this point, I don't even care how they will come together. It's pretty funny how Zelda can curl herself up into such a small ball... seems a very catlike thing to me! We are about a month away from fall, and I am counting the days. I had such high hopes for TransAtlantic, based on the reviews I'd been reading. It went back to the library unread. It just didn't hold my attention, and I was uncomfortable with the Frederick Douglass section. Members of my book group were raving about it yesterday, and I just held my peace (partly because I'd actually read so little of it). Sounds like a lovely day by you. Our oldest daughter leaves for college tomorrow, so we are packing up, and then having a barbeque tonight with her best friend. I also have 2 reviews to write up, including the audio of Cooked, which we totally enjoyed on our recent trip -- so thanks to you for that! Have a great week. Col - So glad you enjoyed Cooked - will look forward to your review! I seem to be gravitating toward food books lately. Salt, Sugar, Fat is an interesting contrast to Pollan. JoAnn, what a great way to spend a Sunday am with your beloved Zelda at your feet:) It's a glorius day here as well, and like you, I am anxious for sweaters, jeans fires at nice and apple pie --- but not snow. Enjoy your day. Diane - I'd be happy if winter ended right after New Years. Snow is so pretty, but such a hassle. Already hoping for more time in Florida this winter! I am anticipating autumn too - I can't wait to start wearing cosy jumpers again. Sam - Me, too! I love everything about fall. I haven't read Colum McCann yet despite hearing so much about him. I thought I might try Transatlantic. None of the others have really appealed to me. Nicole - I hope you'll still give Colum McCann and TransAtlantic a try. All the rave reviews make me wonder what I'm missing... especially since Let the Great World Spin was one of my favorites several years ago. Elinor Lipman is such a good author to read on a summer's day! I have a row of her books on my shelf for (coolish) summer mornings to read with my coffee. Jenny - I'll definitely be reading more of Lipman's books. The Inn at Lake Devine has been recommended by several friends. I'm so excited about fall, too! I'm ready to start homeschooling again, ready for lower temperatures, ready for the changing colors. Fall has always been my favorite season. I understand your reaction the Transatlantic. I haven't read that particular book, but I have experienced not enjoying a book that everyone else has raved about - most recently, May the Road Rise Up to Meet You. Carrie - I always feel bad when a book everyone loves misses the mark for me, but this is especially disappointing since I loved Let the Great World Spin. Hope your school year gets off to a great start... fall feels even more like a new year to me than January! You drink your coffee black?! I can't do that. I live for coffee cream. :-) I can't wait for fall either. It's the best season. The chance to wear sweaters and boots, there's Halloween, and beef stew. . . Yum! Vasilly - I switched to black coffee about 15 years ago when I did Weight Watchers. I have since gained back the 20 pounds, but kept the black coffee habit! I like the way you wrote this post. It felt very homey. Looks like you are in the middle of lots of options in books. That's what makes reading such a wonderful hobby. If one doesn't work, you pick up something else. Margot - I'm glad you liked this post. Have seen other bloggers use this format for their Sunday Salons, so thought I'd give it a try. Not sure why I'm having such a hard time settling in with a book this month. Audible honors the book-return if you end up disliking it. I have sent one back and it was painless and only encouraged my audiobook habit. Wish sweet Zelda a Happy Dog Day! Care - Well, I decided to test audible's return policy. Am pleased to report it was quick, easy, and painless... I do love that company! I love sweaters but I've stopped buying them because although it can get cold here in SoCal, my office has a tendency to be too hot or too cold and during winter, it is wayyyyy too hot! It is great to watch the kids grew up and head into new phases of their lives, isn't it?! I was thoroughly enjoying summer and not looking forward to fall/winter at all - that is, until summer temps came back with a vengeance! Now I'm looking longingly at my sweaters wishing I at least needed to slip one on in the evenings! Lisa - I actually had a light fleece on when we were out on the boat the other night. Heavenly! What a precious photo! I love it. Everyone so comfy on a Sunday morning. Thank you for sharing Zelda today. Thanks, Judith. 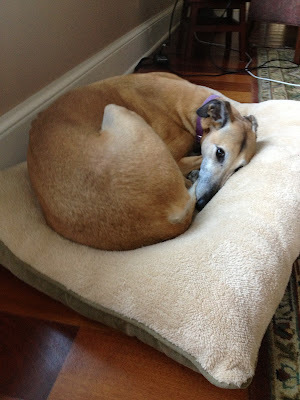 Zelda is retired greyhound we rescued three years ago. She certainly loves her new life as a pet! I find it so disappointing when I don't feel a connection with a book I was looking forward to reading. I hope Transatlantic improves for you. Fall is a great season...cozy sweaters. football and oh those lattes! Zelda looks so cute and cozy on her bed! Ah, fall brings all things pumpkin! I love it. I've had trouble finding inspiration to write reviews too. I'm trying a shorter, more casual approach, which seems to be helping.